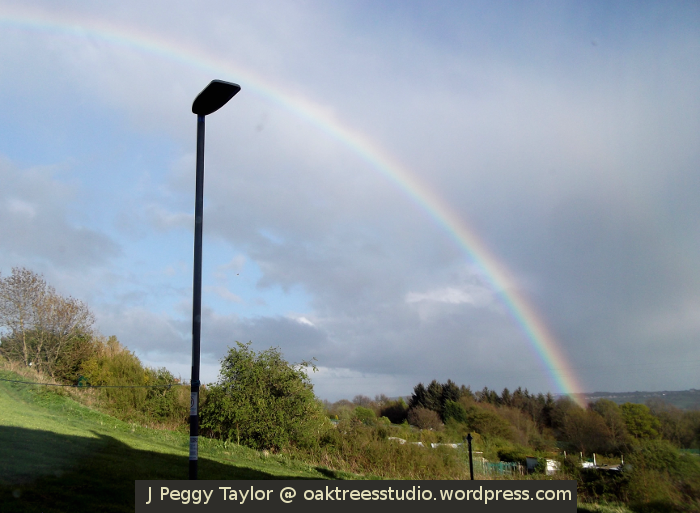 Wordless Wednesday: Sunshine after the rain … and a rainbow too! We certainly experience lots of weather up here on our hillside overlooking the valley. Fascinating cloudscapes are a regular feature of our landscape. I love cloud-watching – I could watch them for hours. Big fluffy cumulus clouds often fill our Summer skies. I loved the light and shadow patterns falling on this cloudscape from the evening sun as the clouds sailed off over the woods. We sometimes spot dragons or dogs or mice chasing through the cumulus as it coasts across the sky. One day last Summer, an elderly neighbour pointed out a peacock with its tail feathers streaming out behind. It’s amazing what we can find in the clouds. 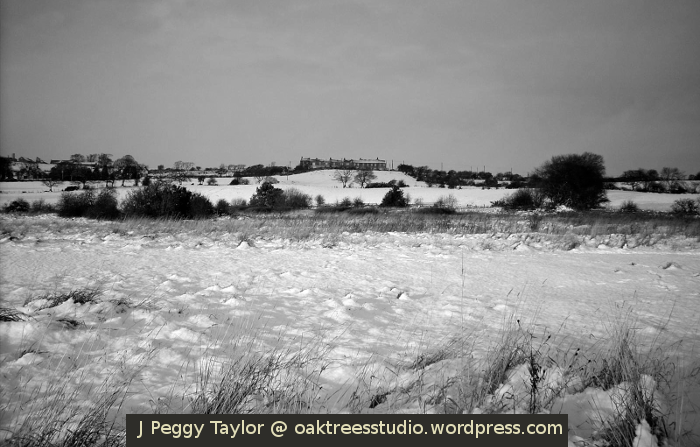 The low Winter sun is behind me in this photo, shining across the snow-covered meadow and up to the houses on the hill. I love the way the sun catches the undulations in the soft foreground snow – it reminds me of warmer days on sunny beaches. We often complain about rain here in England, but a rainy day Springtime walk through the woods to the river is an absolute joy to the senses. The delicious earthy smell of wet woods combines with the sweet scents of rising sap and trees in flower. 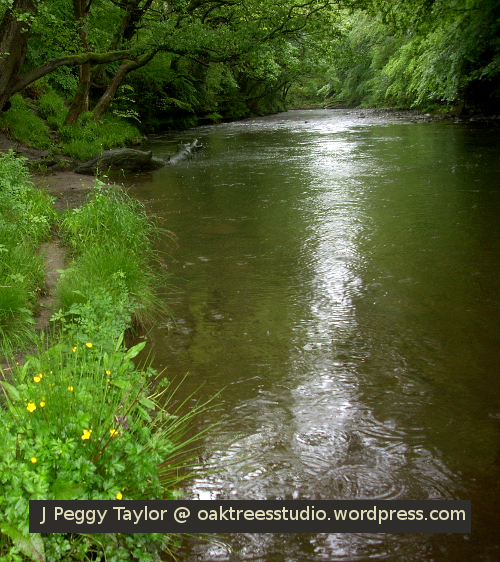 The rain awakens the river from its sleepy state and stirs it into urgent action. 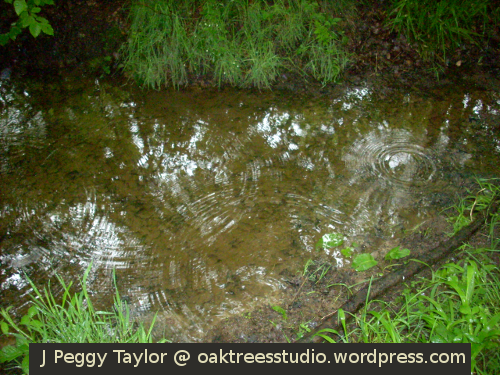 I love to watch the patterns in the swirling water and here the falling raindrops add their own perfect circles on the surface of the river. Mist lends an air of mystery to our everyday landscapes. 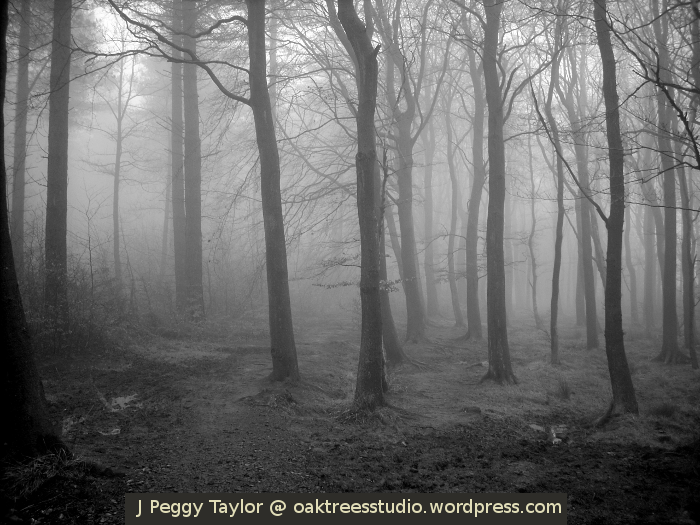 Our regular walk through the beechwood looks so different when the woods are cloaked in mist. I also find, with our view being shortened, it makes us focus more on those things close at hand that we can still see clearly, so sometimes we spot things we might otherwise have missed. We gaze into the murky distance and our imaginations create all kinds of imaginary shapes that vanish into the mist when we walk nearer. 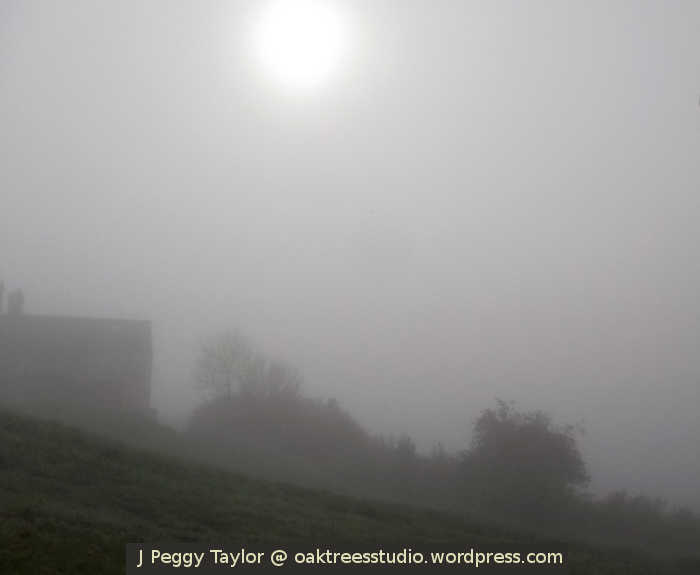 Misty day walks can be creatively inspiring, stirring ideas that lurk shrouded in mist in our mind’s eye. You can find more weather photos in black and white in Cee’s Black and White Photo Challenge this week. There are some landscapes close to where we live that I find myself photographing over and over again, in all weathers and in all seasons. For Cee’s Fun Foto Challenge this week on the theme of landscapes, I thought I’d share a few of them with you. 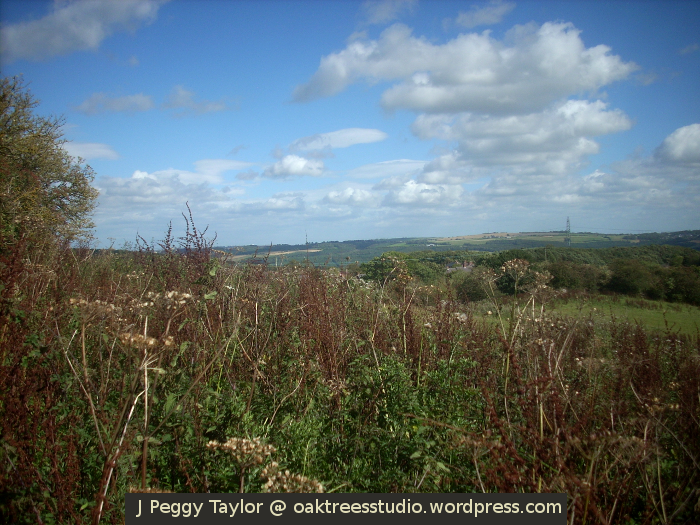 My header image is one of our regular paths to the woods, looking across to the trees in their Spring greens on the edge of the wood, with the yellow of blooming gorse shrubs brightening the fields. From our front window we look out eastwards towards the woods. Looking east also gives us the morning sun and some beautiful sunrises. 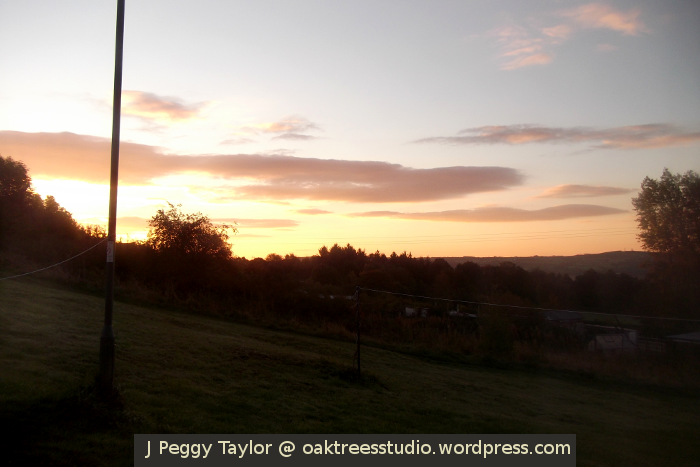 I must say my early morning sunrise photos are generally taken through the window rather than from outside! Sometimes the sun puts on a spectacular colour show but I loved the gentle gold of this one. 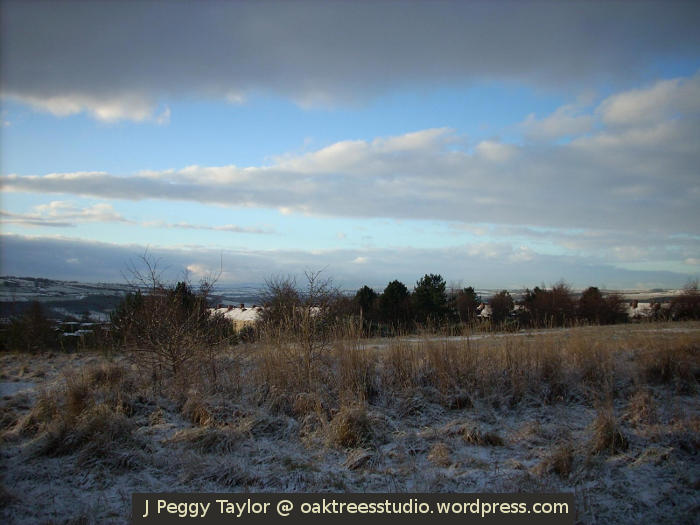 You’ll see this same view in very different weather on the image I’ve chosen for our Oak Trees Studio greetings card across on the right. A favourite walk westwards from our village, along part of an old railway line, gives us fabulous landscape views out across the valley. In Spring we see the trees gradually greening up with their new season’s foliage and the bright greens of distant field crops. Summer brings darker greens in the trees but also bright splashes of yellow in the fields and, on a clear day, the purple of the heather high up on the moors. This view westwards with its ever-changing vista often provides us with a weather preview before we experience it first hand and also some wonderful cloudscapes. As we wander along the valley side, we’ll often stop to take in the view, spotting the shapes in the clouds or commenting on the sunbeams glancing down through the deep cumulus clouds. I love the moody sky over the Summer valley in this photo. In Winter our walks usually take us out into the woods, whether we are squelching through oozing mud and puddles or crunching through crisp snow. When our Winter ramble is done, we head homeward, leaving the woods behind us and dropping back down across the meadow path into the village. Again we can take in the scenic landscape looking westward over the valley, with its big skies and cloud patterns. At this time of year, if we time it right on a clear day, we can watch the setting sun slip down behind the horizon as we emerge from the cover of the woods and follow the field path down to the road. I hope you’ve enjoyed this brief glimpse into my daily landscapes. Do take a look at the landscapes and seascapes others have shared for Cee’s Fun Foto Challenge this week. Autumn and Winter have converged! I like to change my blog header for each of our seasons. Being a keen gardener and based in the UK, my seasons divide neatly into three-month blocks: March, April, May is my Spring; June, July, August is my Summer; September, October, November is my Autumn; leaving December, January and February as Winter. The end of November – beginning of December is when Autumn and Winter converge, and we have definitely noticed changes in our weather. November has been dull and dreary with mists and fog, but December has already brought us drier, brighter weather, though colder, with the beginning of frosty nights. 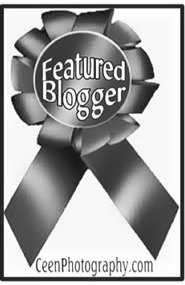 For my Winter season blog header, I decided to choose a very wintry image. 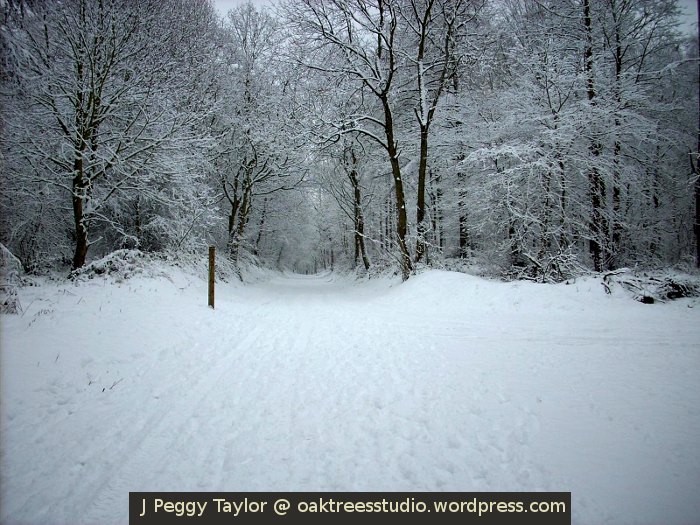 The header is taken from this photo I took a few years ago at the entrance to our woods after a heavy snowfall. I love the way the snow conceals almost everything, just leaving the tree trunks and a few branches visible. The other obvious thing that remains visible in the image, is the wooden signpost that marks the converging footpaths at this point. If you look very carefully you may also just see the faint tracks in the snow – some coming in from the right and others heading straight on along the old railway path. 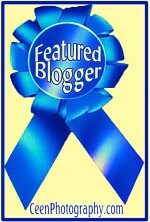 This post also links to the WordPress Daily Post Weekly Photo Challenge on the theme ‘converge’. Do take a look at what others have posted for this challenge. There’s nothing quite like a wet woodland walk for reviving the senses and uplifting the soul – and such a walk was a perfect prescription for me this week as I have been rather busy dealing with an irksome legal issue. It also gave me a great opportunity to grab some photos for Cee’s Fun Foto Challenge this week as the theme is Water. On the day I flung down my papers and pencils and announced that I needed some air, it had been raining all morning. I think up to that point the weather had completely passed me by – my head was definitely elsewhere, full of words and arguments from the problem I was wrestling with. Living on a northern English hillside means we see quite a lot of rain so we’ve come to enjoy the out-of-doors in pretty much all kinds of weather. 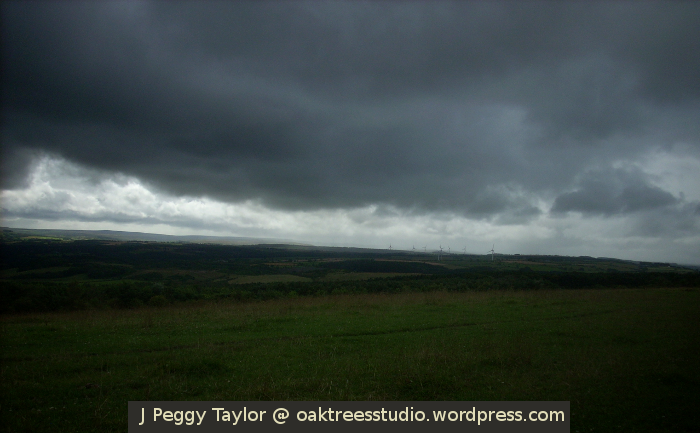 Rain was just fine for me today – in fact it was rather soothing as it pattered down on paths and in puddles. I love the way it runs down the tree trunks making networks of rivulets in the patterns of the tree bark. Some of the beech tree trunks were soaked and stood dark and sombre. In stark contrast, the wet lichen on them had adopted a bright, almost other-worldly, iridescent green glow. It was quite beautiful. Walking in the rain also meant that I was carrying my umbrella, which in turn meant I didn’t really have many spare hands for taking photographs. My son liked this as it meant I didn’t stop quite so often! We headed off down through the woods towards the river. For some reason this seems to be a direction we are often drawn to on rainy days. Not too surprisingly, we passed no-one as we strode along, gulping in deep breaths of the gloriously fresh air. It was my son who uttered the phrase on this occasion, but it’s always said on days like this – “I love the smell of wet woods!” It really is amazing, especially now, in Spring. You can smell green. Yes, I know green is a colour – but in damp woods in Spring, green takes on another dimension. It colours the air with a heady aroma of newly grown leaves and flowers. Ah, yes! You can smell green! 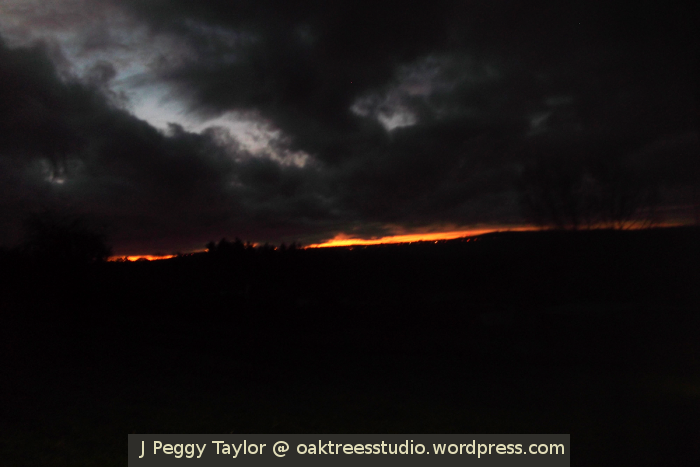 Today there was a yellow afterglow too – gorse! For everyone who doesn’t know, gorse is a very common prickly shrub here in the UK that bears the most beautifully yellow pea-type flowers. In a light Spring breeze you will know you are in the presence of gorse when the gorgeous honey scent reaches your nostrils. Along the path where we normally spot lots of bees, butterflies and other interesting insects … today we saw just one brave moth! However, the trees were full of birdsong, which we enjoyed as we walked. Soon we were approaching the river. 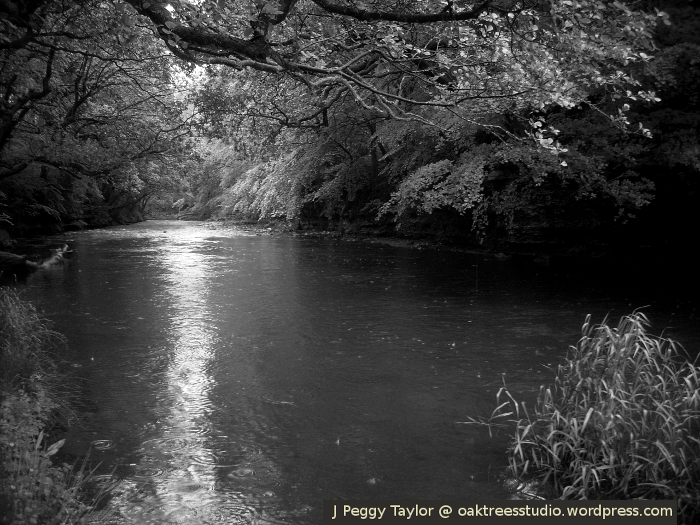 The river has a smell of its own – earthy and distinctive. 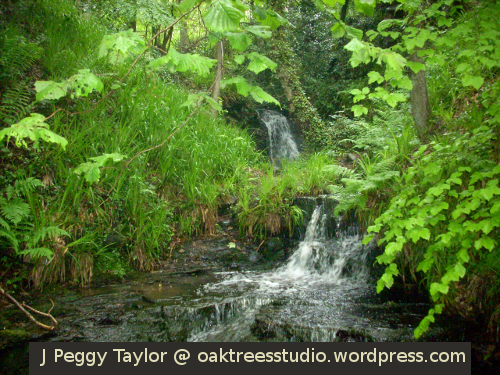 It rises high up on the moors and gathers its waters as it flows down through the wooded valley. In the part of the valley we were heading to today, the river runs through a rocky gorge and is fed by steep sided streams (we call them ‘burns’ up here in the north 😉 ). 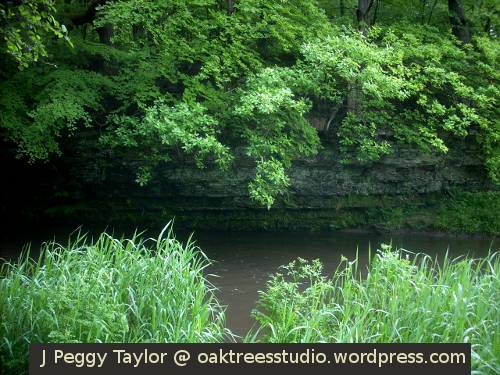 This part of the river is known as ‘the crags’ as there are some substantial sandstone cliffs. It is amazing to think these rocks have been around about 300 million years! They were formed during the Upper Carboniferous period when our part of the world lay next to the equator and these rocks were part of a tropical swamp with huge primitive trees, tree ferns and dragonflies. Our sandstone crags are the remains of fossil soils.